BAT - BLOG : BATMAN TOYS and COLLECTIBLES: VIDEO: Bat-Blog BATMAN TOY DRIVE Appears on Local TV Station, News 9! VIDEO: Bat-Blog BATMAN TOY DRIVE Appears on Local TV Station, News 9! Wow.... WOW! 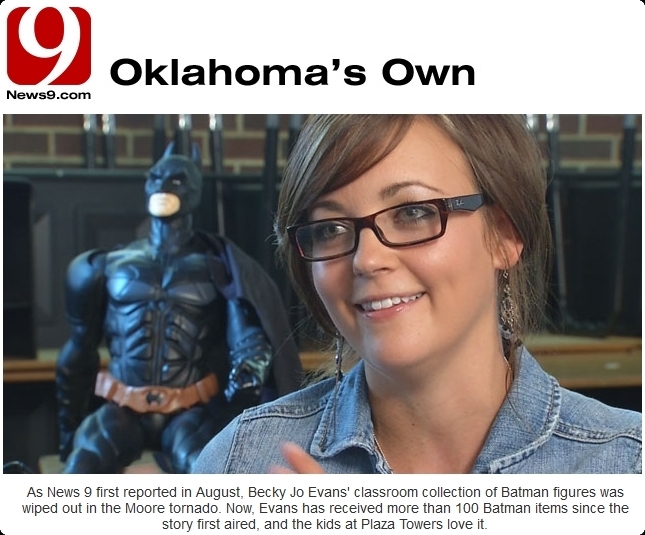 The big news with the Bat-Blog right now, and the BATMAN TOY DRIVE we're doing for the School Teacher who lost her Batman Toy Collection during the May 20th Tornado in Moore, Oklahoma, got some major press last night. It's all been pretty exciting! Yesterday, I was contacted by Michael Konopasek, a News Reporter for our local Channel 9 TV News Station, here where I live, and he said he was doing a follow-up story on Becky Joe Evans who is now starting to become known as the "Plaza Towers Batman Teacher". Last month they did a story about her and after being inspired by their broadcast I started a Toy Drive to see if me and my readers could help. Somehow they found out about the Bat-Blog doing this and decided to add me to the broadcast. So, I went to their building to be taped. Yeah, crazy right?! Wow! It was crazy! To be honest, I really hate having my photo taken, even by friends or family. But I knew it would be great press for our event so I went to be interviewed. Now, knowing that you're gonna be seen by a ton of people... is completely nerve-racking, ha! The funny thing is that they interviewed me, on camera, for approx. 30 minutes... and then, after editing, I only appear for roughly 30 seconds, ha! But they did mention the Bat-Blog and how we're trying to raise donations so that was completely wonderful. But the best part of the whole thing, honestly (for me anyway) was that they went to the Moore Elementary School and they filmed some of the stuff that has been donated by Loyal Bat-Blog Readers. Oh man! This is the first time I have got to even see this stuff. it's been incredible. I'm so thankful and grateful for the amazing generosity of the Bat-Blog's readership. I mean, I know that the response rate has been pretty good because everyone who has sent stuff, first, had to contact me for a mailing address. So, I knew those numbers were more than I expected (way beyond expectations) but to actually get to see all the great stuff people have sent... it's beyond words. OK, I'm starting to realize that I'm almost writing a novel here, ha ha, sorry about that, but I'm really emotional about this and at the same time very excited! Some Fans of this site have really gone the extra mile towards acting in a very giving way and I'm deeply touched by it. Honestly, I'm extremely grateful, Thank you everybody... Thank you SO much. Please check out the News 9 Video down below and you will see what people have been sending in. Keep in mind that those bookcases were practically empty! HEY, WAIT! ONE LAST THING!! The BATMAN TOY DRIVE is still going on and if anyone wants to know how they can get involved then please just read the post right under this one. There you will see special instructions on how YOU can help. Please do. It's a great cause and it create some wonderful karma for you. Also, we want to thank the Reporter Michael Konopasek and TV News 9 for the boost in awareness of our cause. They've been great! Congratulations Tom! You're doing a great service here, and it's great to see the results. I just watched your story and I wanted to tell you how much I admire what you put together for that teacher and those kids.